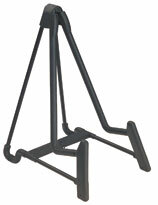 This elegant and lightweight aluminum mandolin stand has a bottom flap hinge for instant setup. ALL instrument support parts are covered with a special non-slip coating to protect your mandolin. The compact, folding design makes it easy to transport and store.